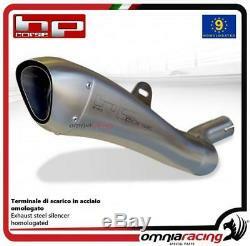 HP Corse slip on exhaust steel homologated Hydroform satin for KTM 1290 Superduke. Stainless steel muffler approved with removable DB killer, available in satin or black satin finish. This drain gives a perfect look to your bike and an exceptional sound with an extra power boost. The material is molded, all resistance is overcome, the excitement takes shape. Hydroforming is not only the name of a new line of exhaust, is something that goes beyond the rules to get where only the imagination had dared to go. The hydroforming technology is incredibly sophisticated in the formation with high fluid pressure that is that pushes towards joining the plate to the wall of the forming mold. And that is how we managed to get a variable form with an incredible seamless volume. The end result is a unique product, sinuous, exciting, for a seamless flow of exhaust gases that is absolutely excellent, with incredibly low thickness of the plate, mechanically rigid and record lightweight. The exhaust from the HYDROFORM line born to equip the most beautiful naked, sport and hyper-sport in our market. With HYDROFORM, the sound, the charm and the power will never be the same. In 1994, the Passion and Experience of Fabrizio Bertollini created OMNIA RACING , with the aim of representing a reference point for everyone fond of bikes. In 2000, when Salvatore Orefice joins OMNIA RACING , the OMNIA RACING Special Parts project is founded, a society based on the passion and competence needed to create and trade the top products for motorbikes. This should allow our customers to feel at ease and to trust us. All this has allowed us to become, in less than a decade, a reference point in Italy; in addition, our products are increasingly demanded also in Europe and in the US. L'item "HP Corse Pot D'Echappement racing Hydroform acier pour KTM 1290 Superduke" est en vente depuis le mardi 7 novembre 2017.